Febrile seizures in toddlers. Are they serious? What should I do? It was summer of 2013, the worst day of my life, it really was. Let’s back track to the day before! A lovely hot summer’s day, we had the paddling pool out, she was having fun! A super day of cooling down in the early July sun. She was happy, I was happy getting wet from her splashes coming down the slide gliding into the pool. That evening she went to sleep without any problems. The ambulance men, told me it was time to go to hospital, I got my things together and off we went. We arrived at hospital, Chelsie was still asleep and no signs of waking. Totally oblivious where we were and no idea we had traveled in an ambulance 5 minutes earlier. She had her observations took, and got discharged into Outpatients. We awaited to be called in to see the doctor, to confirm why she had a Febrile Convulsion. It was a while, I sat there in the waiting room, with her on me, and I was hot, she was hot! Finally, the receptionist and nurses had given us a side room with a bed and a fan! Four hours had passed since her Febrile Convulsion, we finally saw the Doctor and he confirmed she had tonsillitis and the reason behind her seizure. I felt relieved, and we were able to go home. Chelsie, still looked unwell, and still very sleepy. Throughout the evening, to bed time, she wasn’t fully awake and hardly eaten. The following day, Chelsie awoke, as if yesterday NEVER happened. Yep, she arose with a spring in her step, back to her normal self. 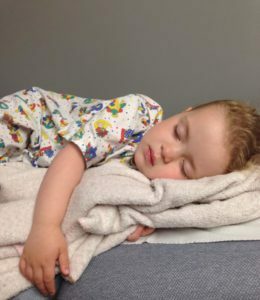 Febrile seizures in toddlers, or known as febrile convulsions, are most commonly affect children between the ages of one and four (my daughter was four years and 2 months). However, they can affect any child anywhere between six months and six years old and affect in 1 to 20 children. So why does a child have a febrile convulsion in their early childhood? Well, the area of a child’s brain that regulates body temperature is not fully developed until around 4 years old. So, if a child develops an infection, this can lead to the core temperature of the body quickly rising. When the body quickly rises, the brain overheats causing the child to have a seizure. A Febrile seizures in toddlers can be very frightening for the parents or carers of the child. During the seizure the child may appear to stop breathing and the lips may go blue. The child may have been unwell over the past day or so and will be hot to touch. While the child is having their febrile convulsion (seizure/fit), we need to protect them from any injury, remove any dangers, objects from the area where they are. We need to pay attention in protecting their head, could place a cushion, jumper under their head. We need to loosen any clothing around their neck, and remove any clothing or bedding from them. Open any windows to regulate air within the room, but take care not to over-cool the child. We do not hold the child down during a seizure. Take a note of the time when the febrile convulsion started and call 999 immediately for help to arrive. Once the seizure stops, open the airway and check for normal breathing. If the child is breathing, place them in recovery position to protect their airway. We need to constantly monitor airway and breathing until help arrives. This entry was posted in Children's First Aid, courses, cpr, febrile convulsion, paediatric, Stafford, Stone, walsall and tagged 999, A&E, ambulance, Children, courses, cpr, febrile convulsions, febrile seizures in toddlers. Bookmark the permalink. ← Breaths in CPR are still important!